These English conversation lessons will help you with your English speaking and English listening while giving you the confidence to speak with native English speakers. We have basic English conversation lessons for beginners and also beginner level business English conversation. These are perfect for beginners wanting to improve their English conversation skills. The best way to learn English is to practice spoken English in conversations. Use this app to learn English. Wonderfully helpful for some friends of mine who are learning English. If you are looking for a GREAT learning and user experience this is the app for you! Great work!! 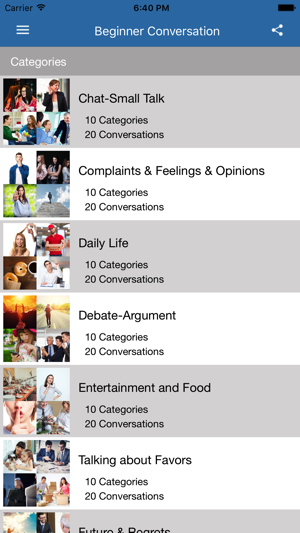 This is a great App for every level of English speaker. Great for beginners and for those trying to improve their conversational English.